High confidence result on Laurynas' face. Machine learning with deep neural networks (commonly dubbed "deep learning") has taken the world by storm, smashing record after record in a wide variety of difficult tasks from fields that were largely unexplored in previous years, such as computer vision, speech recognition and natural language processing. One computer vision task that benefits from such clear gains is facial recognition (identifying a person based on his/her face)---a deep neural network being the primary tool used for this purpose at Facebook, among other places. 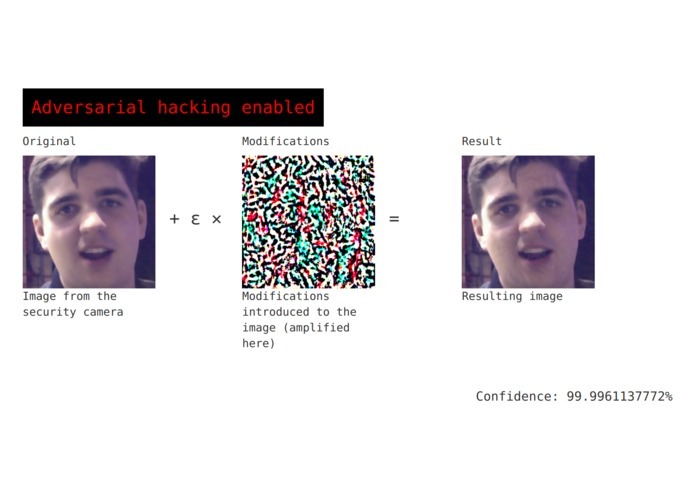 how simple it is to generate such "fooling" inputs algorithmically, if one has access to the neural network used for facial recognition (either directly or through an API). how this attack may be executed in real-time, requiring only a mid-range GPU. But let's take it slowly---what even are adversarial inputs? Propagating the error backwards through the network, updating parameters as we go. Computing an adversarial example usually only requires a crude approximation of the gradient of the desired output with respect to the input image---often, only the sign of this gradient for each input pixel is sufficient. 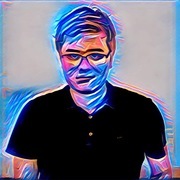 The computed adversarial examples are often imperceptibly similar to the original input---in fact, there is an entire space of adversarial inputs surrounding any correctly classified image, as Szegedy et al. have demonstrated in 2013. Even worse---what's adversarial for one network architecture will very often be adversarial for a completely different network as well---as they are often trained on the same datasets! Therefore, using neural networks in secure applications requires particular care, as adversarial inputs give rise to a potentially unforeseen covert channel for an exploit. 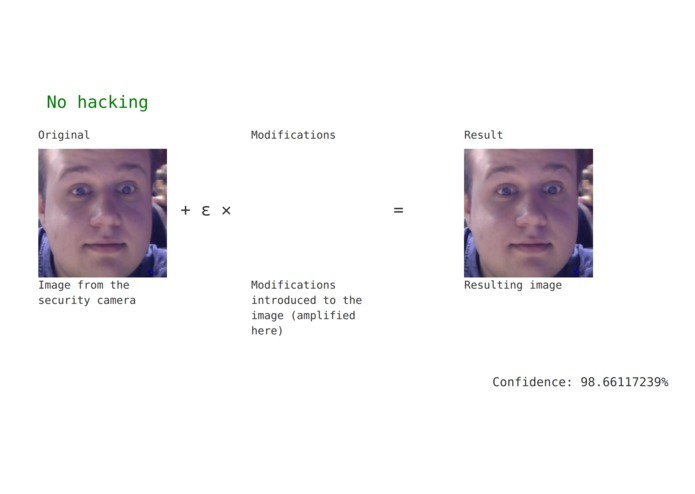 We have planted a "hack switch", capable of intercepting the input and performing adversarial training on it before submitting it for classification---this resulted in a 100% success rate for authenticating as Laurynas, regardless of your facial features. Hopefully, FaceJack has achieved its objective of highlighting this important issue in a clear and concise fashion. We hope to expand it in the near future with further authentication attacks, for example speech recognition-based ones. I primarily worked on the stats reporting system, but I've also set up and managed deployment on Azure ML services. 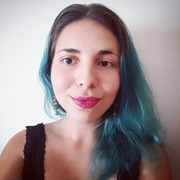 I have primarily worked on developing the algorithms for generating the adversarial inputs, optimising the fine-tuning schedule hyperparameters, and hooking up the back-end with the front-end. I began by transferring the trained VGG deep learning model from Caffe to Keras. Afterwards, I fine-tuned it with the dataset of faces we built during the hackathon, which included Laurynas (the admin) and the rest of us (adversarial examples). 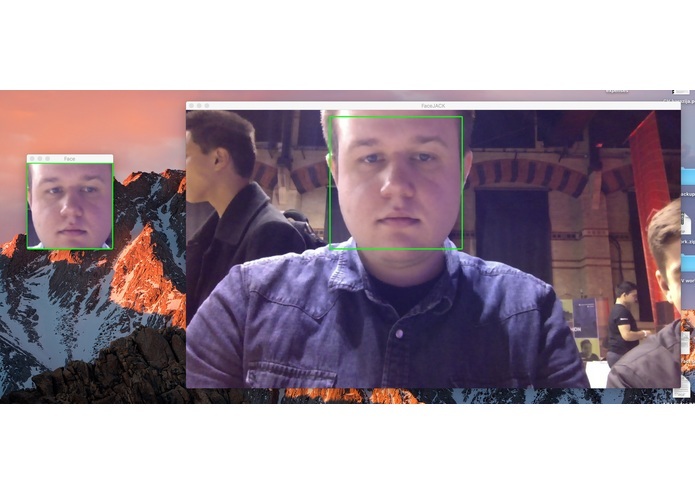 I created the webcam hooks, computer vision part leveraging face detectors, server to receive images and perform the authentication, and gathered and processed the training dataset.